I heard this request at least eleven times during our recent stay at the Waikoloa Resort on the Big Island, and all of them came from my six year-old son. Either I was witnessing the beginnings of my young son’s career in archaeology — or (more likely) the petroglyph field we explored was just plain amazing! If you have a bit of archaeologist in you or just love Hawaiian history, taking a side-trip to the petroglyph field in Waikoloa is a must. In Hawaiian, these petroglyphs are known as kii pohaku (literally “rock pictures,”) and they provide intimate and personal insight into what life may have been like for the people who carved them. They’re kind of like ancient graffiti. The author's six year-old son posing next to a petroglyph of a man. Budding archaeologist? Could be! To find the petroglyph preserve in Waikoloa, you’ll need to enter the Waikoloa Beach Resort, then continue for about a quarter mile and then turn right at the first parking lot next to the gas station. Park and then walk to the right of the station and pick up the Kings trail (also known as the the Kiholo Puako trail). The petroglyphs are located about a quarter of a mile north of the Waikoloa Kings Shops, located on the Kings walking trail which runs north and south of Waikoloa for miles. 1. Exploring is easy, fun, and great for families: If you have young children, your options are quite slim if you want to see something cultural, but entertain them at the same time. Because the hike is a bit uneven, make sure you and your children wear sneakers or sturdy shoes, But, if you have the right footwear, the actual hike is quite easy, even for children. 2. History is cool: According to the markers on the trail, the most recent petroglyph is more than a century old. And, some are many centuries old. Originally, there was no written Hawaiian language, and some petroglyphs are thought to be astronomical symbols, travel markers or commemorations of historic events. 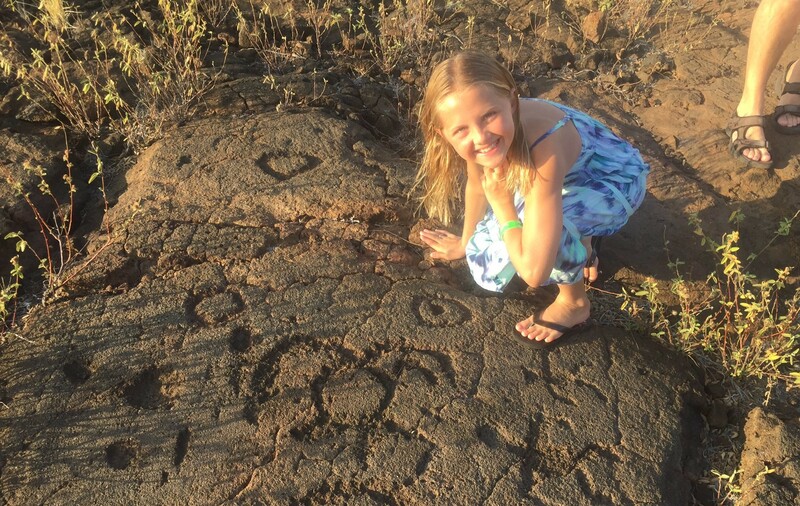 During our walk, we saw petroglyphs that represented honu (turtle), ohana (family), the sun, horses, people, and even English and Roman letters and numbers left there by more contemporary visitors. 3. The field features more than just petroglyphs: The Waikoloa petroglyph field is one of three major petroglyph preserves along what’s known a the Kings Trail. This ancient pathway is a 175-mile Ala Kahakai (“trail by the sea”) that links communities, temples, fishing areas and other important locations on the western coast of the Big Island. According to the informational markers on the trail, ancient Hawaiians or paniolo who walked or rode the King’s Trail would often have to spend the night on the trail, and they would build rock shelters to stay out of the wind. Around these rock shelters is where you’ll find the most petroglyphs in Hawaii since, presumably, they were bored at times and would carve into the surrounding rock. My daughter, Sadie, wasn't quite as enthralled as her brother, but she also found the petroglyphs to be fascinating! She's here with a petroglyph of a honu? 4. You can take a tour: If you want to learn even more about these amazing petroglyphs, take the complimentary guided tour that is provided Thursday-Sunday at 9:30a.m. 5. They may not be there forever: Due to erosion, normal wear-and-tear, and human interaction, these petroglyphs won’t likely be around forever. So, take advantage of the opportunity to see them while you can! And, please stay on the trail and do not approach the petroglyphs for photos or rubbings. These are fragile carvings, possibly thousands of years old and are easily subject to damage and erosion. If you happen to be on the “other” side of the island, enjoying a Volcano Hiking and Sightseeing Tour, you still have a chance to see some amazing petroglyphs. The Puu Loa Petroglyphs are located at Hawaii Volcanoes National Park and are accessible by foot. 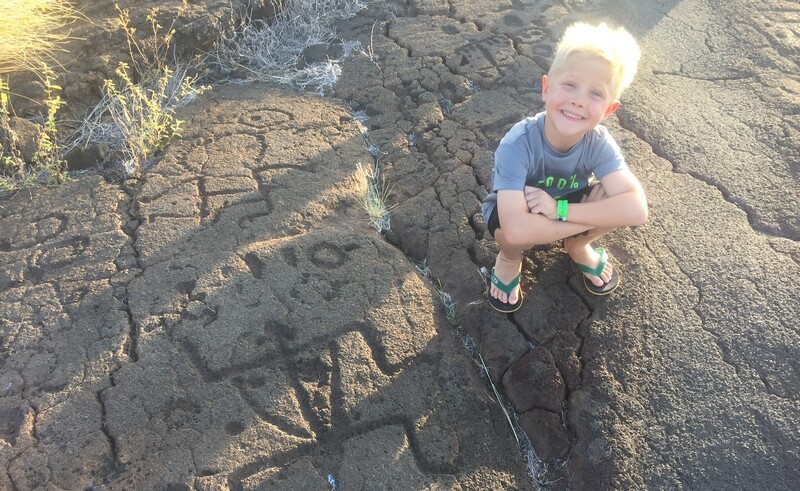 Judging from my young son’s reaction, the Waikoloa petroglyphs in Hawaii really are a sight to behold. So, if you’re Kona-side on your next vacation, make sure to detour and explore these fascinating creations.